Boat-building was a hobby-turned-business of Newton Ancarrow’s that eventually led to his passion for the conservation of the James River and documentation of native wildflowers. Newton Ancarrow earned a chemistry degree at the University of Richmond. He worked for American Tobacco and a company called Experiment, Inc., where he tested rocket engines. As a native Richmonder, he grew up around boats on the James River and later, on the Rappahannock River. In 1957, he acquired a New Jersey boat building company and moved it to Richmond. Ancarrow’s goal was to design luxury speed boats that would go 60 mph. Ancarrow boats were known for being luxurious, fast and appealed to the world’s wealthiest boaters. Center photo above is of Newton Ancarrow and his wife Josephine in one of his first Ancarrow boats. View the PDF of Ancarrow’s 1959 boat catalog. 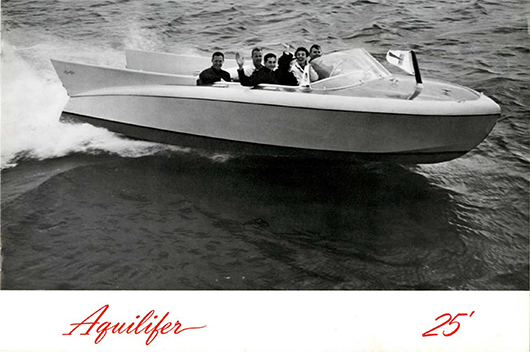 A group of boat enthusiasts riding in one of Newton Ancarrow’s boats, the Aquifer.